Does Beer Go with Chicken? What Do You Think?!? With the LA food and wine festival past, I want to bring another food and beverage pairing to everyone’s mind: craft beer. Some might not think of craft beer the way they think of wine. I love pairing a good craft beer with a home-cooked meal. IMO, a fizzy, spicy, vaguely fruity Saison complements the spice and depth of flavor in Asian-inspired dishes perfectly. 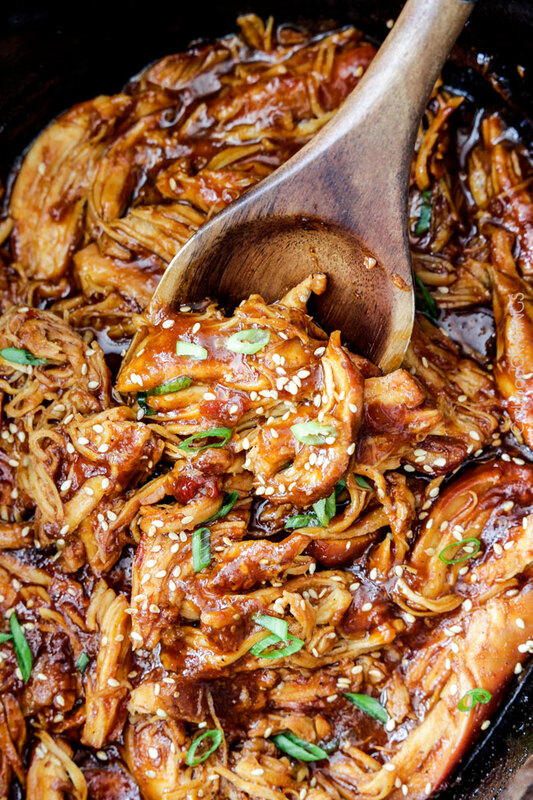 I’ve been attempting variations on this recipe (http://www.carlsbadcravings.com/asian-sweet-chili-sesame-chicken/) trying to find the perfect beer pairing for the sweet/spicy Asian flavors. Carefully toast your sesame seeds and chop up some green onions for garnish. Add chicken to the bottom of the crock pot. Little known fact: If you are like me, you ALWAYS forget to thaw your meat a day or two in advance. Am I right? Personally, I’m not a fan of thawing meat in the microwave. But you can throw your frozen chicken breasts in the crock pot with the other ingredients and they will still cook! Try it! Whisk the sweet chili sesame sauce ingredients together, and pour them over the chicken. Shred the chicken! Then add 1 ½ tablespoons of cornstarch, mixed with ¼ water, to the crock pot. Stir everything around and cook on high for 20-30 minutes… or until the sauce thickens. Add Sriracha if you want it spicier, brown sugar if you prefer it sweeter. Serve with rice (and beer). Garnish with sesame seeds and green onions. Let me know what you think and what favorite beer you’d pair with this recipe! *No one paid me a darned thing to mention Vitamix. I just happen to be a huge fan!